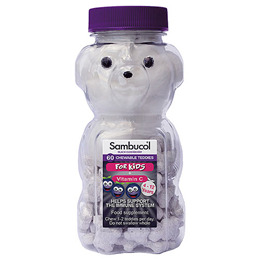 Sambucol Chewable Teddies For Kids are teddy bear shaped tablets, flavoured a tasteful Black Elderberry and contains Vitamin C. This may offer support for your child`s immune system, as well as cell protection from oxidative stress. These teddies are full of Vitamin C and Zinc to give your body the support that it needs for a normal and healthy immune system. Sweetener (Sucrose), Binder: Maltodextrin, Vitamin C (Ascorbic Acid), Flavouring: Forest Fruit, Silicon Dioxide, Anti-Caking Agents: Stearic Acid & Magnesium Stearate, Freeze Dried Black Elderberry Juice Powder (AntiVirin). Children 4+: Chew 1-2 teddies per day. If under medical supervision, seek medical advice from your doctor before using this product. Food supplements should not replace a balanced and varied diet and a healthy lifestyle. Below are reviews of Sambucol Teddies For Kids - Black Elderberry - 60 Chews by bodykind customers. If you have tried this product we'd love to hear what you think so please leave a review.